Fair Warning: This is an "All Ages" series. Just bear with me. . . I know that I'm writing toward an adult audience, but sometimes even adults just want to have a little fun in their comics, right? I know I do from time to time. So why not check out what's going on in some of those comics you might otherwise pass over as kiddy fare? Allow me to explain. . . When I asked my daughter for some Spider-Man comics to review (I don't have any complete series, just random issues and some one-shots. I'm not a Spider-Man fan) during my Merry Marvel Mainstream Madness, where I'm taking a closer look at some Mainstream Marvel superheroes that my own collection is sadly lacking in (I'm more of a DC guy), she surprised me by pulling out these comics. They were pretty worn and tattered (the scans are from the internet because her copies were so beat up), the covers were torn and falling off the staples. I could tell that she'd read these comics MANY times. I remembered (from the cover) buying her the second issue (Captain America) when she was about 9 years old, when I used to let her pull a comic from the "All Ages" rack while I picked up my subs. She'd picked up the rest of the set herself over the years from the back issue bins. I asked her why these comics? What did they have going for them for adult readers? She told me to trust her. . .these stories were just as fun for her now as an adult as they were when she was in grade school. I still wasn't sold on the idea of reviewing an "All Ages" series in a blog aimed at adult readers based on my daughter's nostalgia. She gave me "That Look" The one that tells me I don't know everything and I should listen to someone else now and then. It's a perfect copy of "That Look" her mom pulls out from time to time. It can be a pretty potent weapon. Anyone who's been married a while knows what I'm talking about. So I took the battered comics and gave them a closer look. Pretty nice covers. Got some nice art in this one. Before I knew it, I was reading one. It was actually pretty well-written. Maybe there WAS something here. . .
Spider-Man decides that if he's ever going to have a good reputation and maybe even make some money from being a super-hero, he needs to be part of a team. Making a bid to join with the Fantastic Four, Spidey is snubbed by their secretary. He decides that breaking Reed Richard's security system will be the perfect way to show the FF that he deserves a chance. In the meantime, the international spy and master of disguise known as The Chameleon has broken into a secret government laboratory and stolen an experimental formula while disguised as Spider-Man. 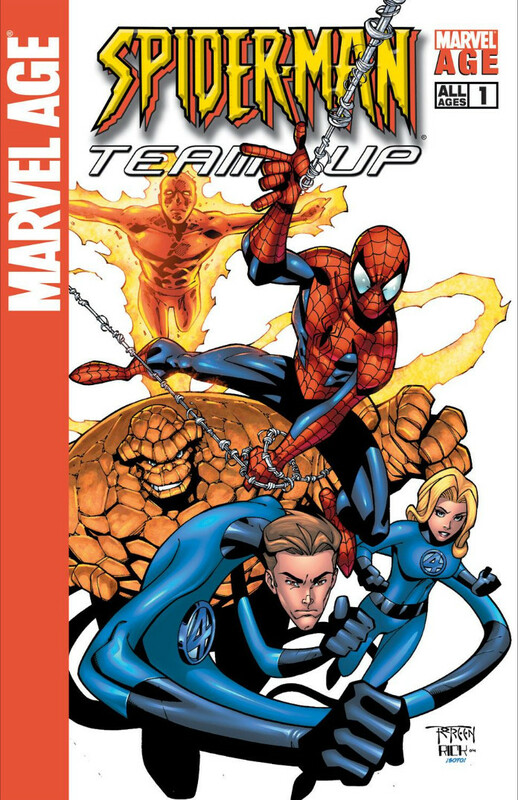 Back at the Baxter Building, the Fantastic Four declines Spidey's offer to make them the Fantastic Five despite his admirable effort at breaking into their headquarters, but when Nick Fury interrupts to inform them that Spider-Man has just robbed a secret Lab, the FF brings Spider-Man along to investigate. Comedy hijinks ensue as the Fantastic Four try to capture The Chameleon while not being able to tell the difference between him and the real Spider-Man. Finally, The Thing throws them both into the air and tells Johnny Storm to rescue the one that screams loudest. With this simple plan, The Chameleon is captured and handed over to S.H.I.E.L.D. I have to admit that I really enjoyed this story. I'm not a fan of Spider-Man or The Fantastic Four, but this story is just a light, humorous and FUN little standalone tale. It's not deep or dramatic. It's not the best comic book story I've ever read, but I liked it a LOT more than I thought I would! Who would have thought that a guy in his 50's could get a kick and a smile out of something sold off the kids rack? I also really liked the art in this issue. I had a notion that this would be a sort of "minimum effort" comic, being that it's aimed toward an audience with hardly any standards beyond "YAY! SPIDER-MAN! ", but the art has sharp, clean lines, great color, and is exaggerated yet realistic in a way that really catches the eye and elevates the story. Overall, I expected minimum effort in this "All Ages" comic and got a brisk, humorous story backed up with some very nice artwork. Since I'm not a fan of any of the characters, it was a pleasant surprise how much I liked this. Moving along! I remember buying this one for my daughter when she was young because of Captain America's "Liefeld Feet" on the cover. Between that and the weird look on Cap's face, this one is definitely the worst cover of the bunch. But enough about that. . . While on a patrol of New York City, Spider-Man comes across Captain America fighting a crowd of A.I.M. foot soldiers. After assisting Cap, the two heroes discover that the attack was a diversion. The real target is Gargoyle (a villain who can turn things to stone for 1 hour), who is after a secret formula. 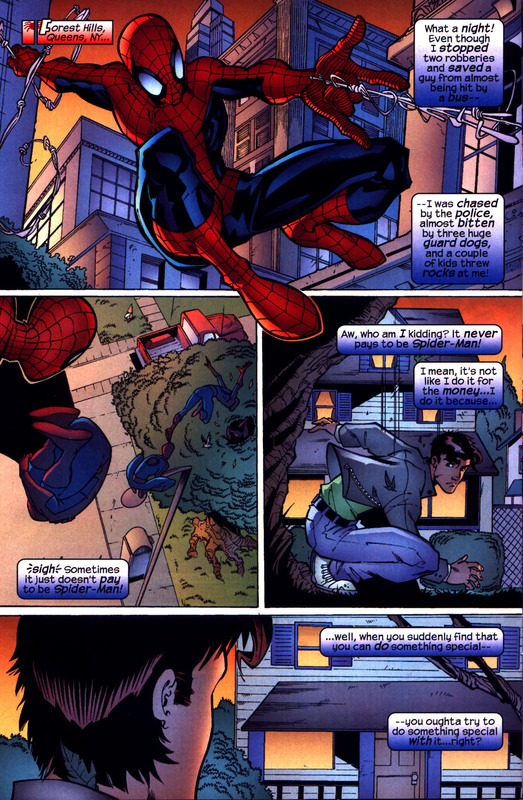 After a long stakeout, where Spidey gets a nice civics lesson from Cap, they finally spot their target and an epic battle ensues. Gargoyle thinks he's gained the upper hand on the heroes, but they break free, capture Gargoyle for S.H.I.E.L.D. and Cap reveals that the formula was never real. . .it's just something they do every now and then to draw out supervillains. The story on this one was quite a bit thinner than that in the first issue, boiling down to two fight scenes and a lengthy discussion on one's duty as an American in between. When an honest look is taken, it seems the story is actually a bit of a contrived framework to hang the civics discussion on. That's not to say it's bad. It's just heavy-handed, depending on your political views. This issue is definitely skewed toward conservative-style patriotism. Personally, when I think of my daughter reading this when she was 10 years old as one of her first comic books, I'm pretty happy with it and I wonder if my buying this comic for her helped to inspire the great person she turned out to be. I know that's a bit much to hang on a comic book, but I also know that little things DO matter when it comes to kids. . .
Unabashed patriotism as the focus of the story aside, the art in this issue (like the cover) is about the worst in the series. It's not terrible, but it has a strange psuedo-anime style where background features are highly detailed, but on characters the body proportions aren't consistent from panel to panel, and Cap's face just looks strange. Overall, this isn't a BAD issue, it's just dominated by a patriotic message that readers will either love or hate, depending on their political point of view. . .I didn't mind it, but it might grind YOUR teeth. The art is also a bit strange in this one. 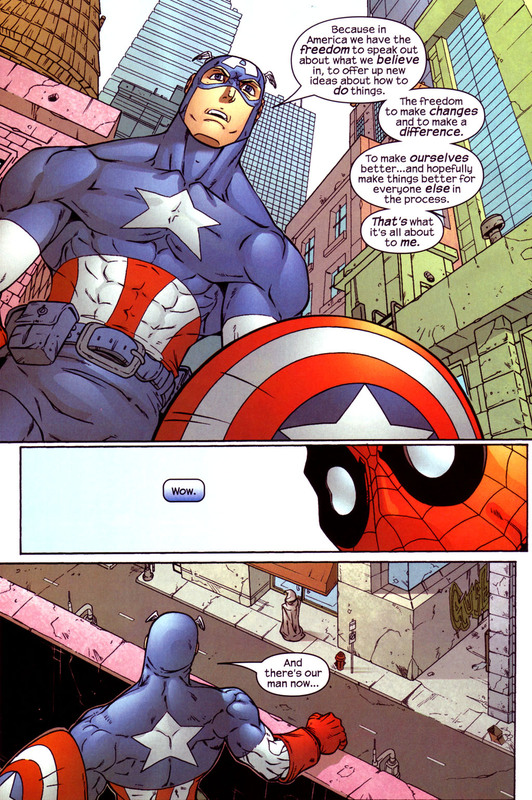 Sort of a shame, since Captain America is one of my favorite characters. He just comes off as very preachy here. Professor X decides that Kitty Pryde isn't living a proper teenage life, so he "volunteers" her to babysit one of his friends' kids. In the meantime, Spider-Man pursues a thief into the subway tunnels and discovers a secret entrance leading deeper than it should. The thief Spidey was chasing is Dreamer, a mutant and Morlock who lives deep beneath the city. When she tries to escape to the upper world, she ends up at the house where Kitty Pryde is reluctantly babysitting. Dreamer, Kitty, and the kids are all captured and taken back down to the Morlock tunnels, where Spider-Man has already been captured. Combining their powers, Kitty, Spidey, and Dreamer manage to escape, but they are quickly recaptured by the Morlock leader, Callisto. Finally, the kids manage to convince Callisto to let them go free, and a valuable lesson in trusting those different than you is learned. Similar to the second issue, this issue is also primarily a "Message" issue. This time around, instead of patriotic duty, we get a lesson in getting to know people you might think are different than you are and finding common ground. Also like the second issue, the adult reader's enjoyment of this story will very much depend on their personal or political point of view regarding things like immigration and racial equality. Fortunately, the story itself is much lighter-hearted than that found in the second issue, so to me the "Message" was presented in a better (meaning less preachy and more natural) way. It also helps that the art in this issue is pretty delightful. It's nice and sharp, brilliantly-colored and cinematic, with expressive faces that perfectly match the light and humorous tone of the story. Overall, what we have here is another "Message" story, but it's presented with a light tone and is backed up by some great comic art. I really enjoyed this issue a lot more than I thought I would. When the villain Looter accidentally releases the imprisoned trolls of Asgard and their leader, Kryllk The Conqueror, who possesses the power to freeze time and travel instantly between worlds (thanks to a magic crystal), Spider-Man and Thor team up to protect both Earth and Asgard. 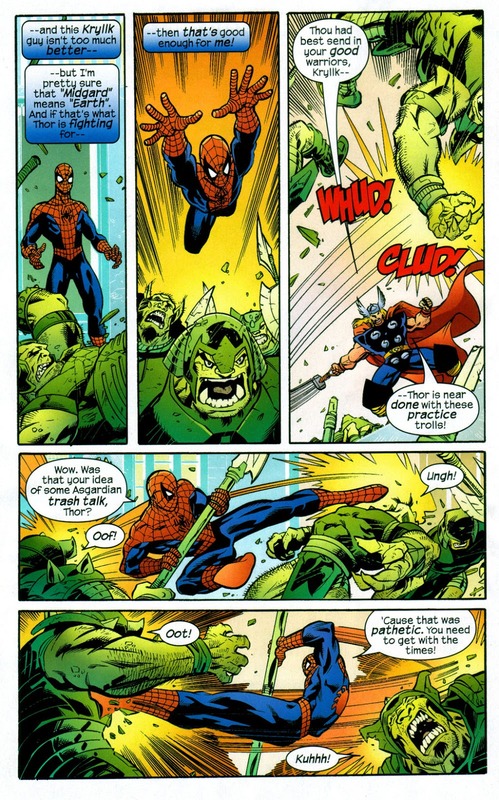 After lessons in trash-talking and much troll punching, Spidey and Thor realize that they will have to attack Kryllk at exactly the same time in both worlds in order to defeat him. . .which they do, following an epic battle which saves the two realms and earns both Thor and Spider-Man the praises of Odin. There's no "Message" in this issue. It's pretty much an excuse for an unusual team-up and a comic full of Spider-quips, Asgard-talk, and troll-punching. . .in other words, it's pretty much all action. But that doesn't make it bad at all. 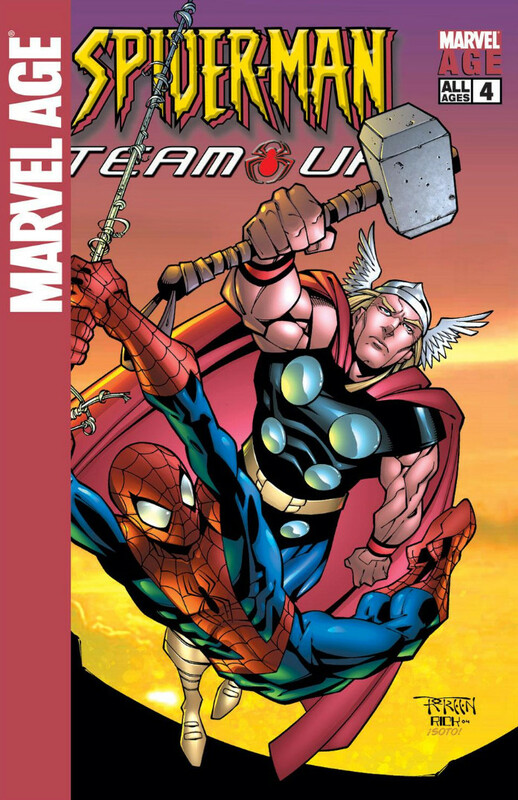 This is actually a really fun issue, with Spider-man and Thor playing surprisingly well off of each other. This is definitely the stern and serious old-school "Verily, Thee & Thou" Thor here and that makes him a perfect straight man for Spidey. The art in this issue fits the sort of Bronze Age throwback nature of this story very well, with lots of action lines and illustrated sound effects during the battles that take up most of the issue. Backgrounds are sparse, letting the artist focus nicely on the action up front. Overall, I liked this issue a lot. It reminded me of the kind of comics I read when I was a Bronze Age kid, and that brought an unexpected smile to my face. There's not much to it, as far as story goes. It's pretty much one long battle, but it's also just good old-fashioned FUN. After Spider-Man saves a girl from bullies, she somehow drains some of his powers and gains them for herself. As he pursues her, they stumble onto the X-Man Storm trying to save a crashing helicopter and the mysterious girl accidentally drains Storm's powers as well, leaving it up to Spidey to save the day. Storm and Spider-Man team up to pursue the girl and find out what's going on, and catch up to her as she is tormenting the bullies Spidey rescued her from earlier with Storm's weather powers. . .determined to teach them a lesson in bullying. 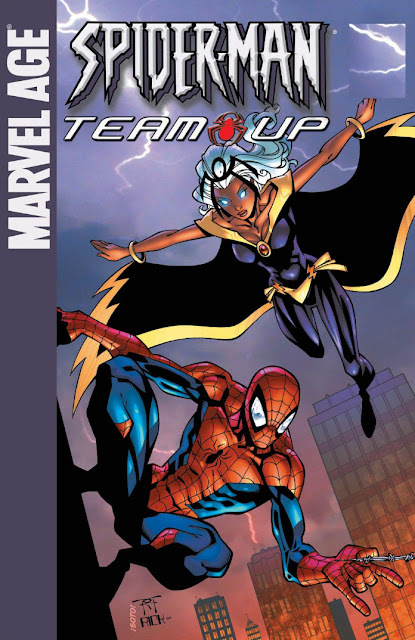 Storm and Spidey manage to talk her down and Storm decides to take her to Professor X. 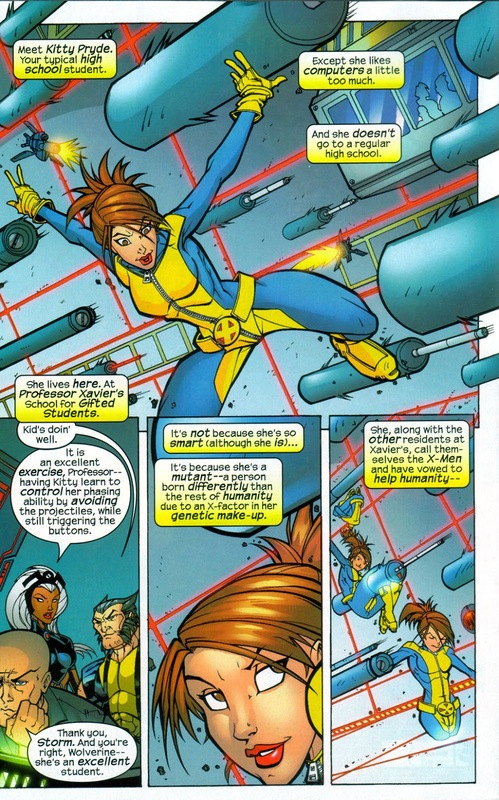 At the end of it all, the mysterious mutant girl decides to call herself Rogue and a lesson in "With great power comes great responsibility" is learned. Finishing up the series, we have another "Message" issue. . .this time out it's "Just because you CAN do something doesn't mean you SHOULD." In other words, the old tried and true "Great Power/Great Responsibility" lesson that's been in the background of Spider-Man comics from day one. It's not as preachy as the Captain America issue, but it's not as light as the Kitty Pryde entry. . .it sort of sits comfortably in the middle ground. What really caught my eye on this issue was the art. It's dark and detailed. Not like I would expect in an all ages comic at all. The art here would easily fit into any mainstream series quite well. Overall, this was a good story backed up with some fantastic art. Once again, my expectations of a minimum effort aimed at an audience with low standards was proven wrong and I found myself liking this story a lot more than I ever thought I would. Nicely done! I stepped outside of my box in several ways for this series (really more like 5 one-shots). I'm not really a fan of any of the characters in any of these stories except for Captain America. 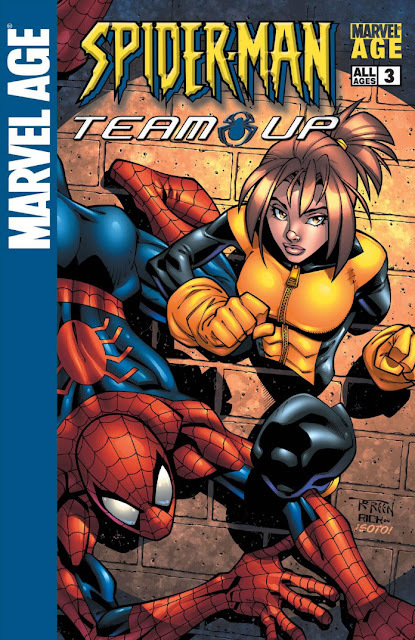 I'm not really a fan of team-ups in general. And then there's the "All Ages" rating. Three strikes against it before I even opened up the first issue. I'm surprised to say that I REALLY liked this series! Sure, it had some rough spots. . .mostly in that 3 out of the 5 issues fly the All Ages flag high by being "Message" stories. . .but really only one was overbearing (Captain America at his patriotic preachiest). 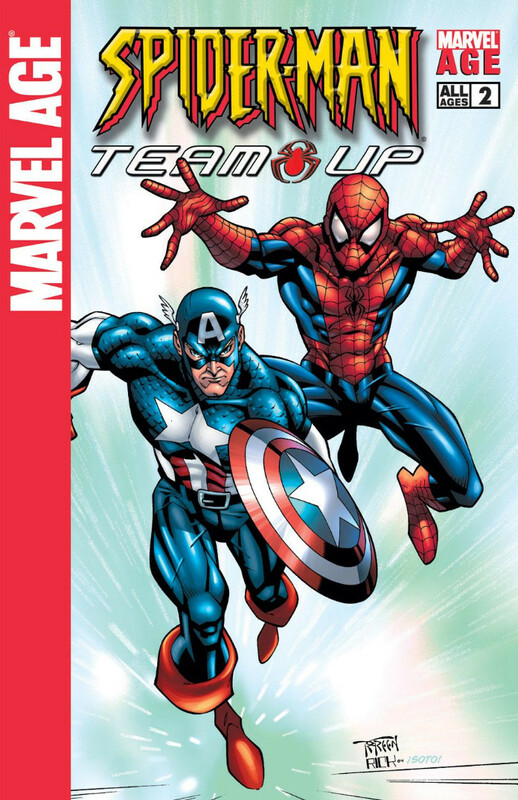 But lessons for younger readers aside, I generally found this series to be well-written, nicely illustrated (except for the Captain America issue, and even that wasn't ALL bad), and just plain FUN! Fun. Now there's a word you don't see in Longbox Junk often. These comics are fun to read! My sour old man expectations of minimum effort put into kiddie rack crap was replaced with a goofy grin starting with the first issue. The quality varies a bit from issue to issue and not all of them are as fun as the rest, but generally-speaking I'm glad my daughter threw these comics my direction. All in all, I'd say to give these comics a shot if you run across them in the bargain bin. They aren't the best comics in the world, but for an hour or so, I definitely felt a few years younger reading them. MORE Merry Marvel Mainstream Madness! Not sure exactly what just yet . . . I'll have my daughter toss me a surprise. She's done pretty good so far. Thanks for bringing FUN to Longbox Junk! We all need a little fun these days, and sometimes it's nice to read these lighter-hearted, all-ages comics that would make great gifts for kids to introduce them to comic books. I really enjoyed this blog entry!